Ivan Karp of O K Harris offered me a show after seeing my mixed‐media works in the book Iden­tity Papers. These are small pieces, 10” tall x 6” wide, made up of sketches, hand‐cut paper callig­raphy, Unlike most of my paint­ings, many contain elements of recog­niz­able imagery. I am very pleased to be showing in a gallery with such a rich and impor­tant history. Ivan Karp served as co‐director of Leo Castelli Gallery from 1959 – 1969, during which time he was instru­mental in launching the careers of pop artists Andy Warhol, Roy Licht­en­stein, Robert Rauschen­berg, Claes Olden­burg, Tom Wessel­mann and John Cham­ber­lain. In 1969, Ivan broke away to launch his own gallery, O K Harris. OK Harris was among the first to exhibit the work of Duane Hanson, Deborah Butter­field, Manny Farber, Richard Petti­bone, Robert Bechtle, Malcolm Morley, Arman, and others. My wife, Vivi­enne Flesher, and I look forward to attending the opening, 3 – 5 pm, Saturday, 29 October. The show remains up until 03 December. Zeit­geist Gallery in Nashville will mount a show of my work, Geog­raphy Lessons, during the month of November. Zeit­geist has been very kind, giving me one of my first shows, Grace, in 2005, and including me in a number of its group shows. 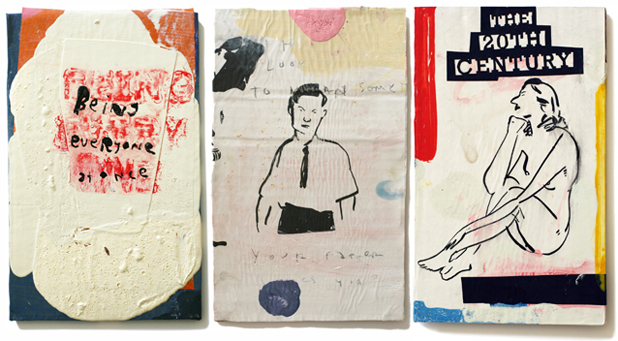 This exhibit consists of ten paint­ings and three hand‐made books. My wife and I look forward to attending the opening, 5 – 8 pm, Thursday, 03 November. The show remains up until 17 December. My illus­trated version of Paris France by Gertrude Stein appeared in the Seeing Gertrude Stein Five Stories exhibit at San Francisco’s Contem­po­rary Jewish Museum and will now move to Wash­ington, DC, to appear in Insight and Iden­tity, Contem­po­rary Artists and Gertrude Stein, at Stanford‐in‐Washington. Beside the book itself, my portrait of Ms. Stein will appear, silkscreened, on the wall of the gallery where the book will be on display. The limited edition letter­press book was published and is avail­able from The Yolla Bolly Press, Covelo, Cali­fornia.